Approaching the 20th century, Americans became more interested in what was going on around the rest of the globe. For “the increase and diffusion of geographical knowledge,” a group consisting of teachers, explorers, geographers, military officers, lawyers, cartographers and financiers gathered in Washington D.C. and formed the National Geographic Society on January 25, 1888. 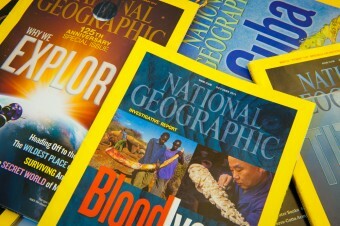 When thinking of National Geographic, the mind usually jumps first to the magazine and its many iconic photographs. When the magazine debuted nine months after the Society’s founding, however, it was a rather dry, scholarly periodical sent to a small number of charter members. That would change when the society’s original president, Gardiner Green Hubbard passed away, and his son-in-law, inventor Alexander Graham Bell, took his place. Bell hired Gilbert H. Grosvenor to edit the National Geographic magazine full-time. The Society as a whole enjoyed great success under the direction of Bell and Grosvenor. Much of this increased interest in the magazine was due to Grosvenor’s editorial changes. He made the content more accessible to the casual reader, including stories written from a first-person perspective in a more straightforward style. There is no tyranny so absolute as a printer’s deadline, but I simply did not have a good manuscript available. A large and rather bulky envelope lay on my desk. Still brooding about the unfilled pages, I opened the package listlessly … then stared with mounting excitement at the enclosures that tumbled out. Before me lay some 50 beautiful photographs of the mysterious city of Lhasa in Tibet. At the time, Grosvenor was worried this act could cost him his job, but it was the beginning of National Geographic’s well-deserved reputation of pioneering what we now call photojournalism. Additionally, the Society has a long history of sponsoring expeditions and research to further understanding and knowledge of our planet and each other. The Society helped fund Robert Peary’s trek to the North Pole, Jacques-Yves Cousteau‘s marine explorations, Louis and Mary Leakey’s study of human evolution in Africa, and Jane Goodall’s work with chimpanzees and gorillas, just to name a few. Aware of the planet’s dire need for stewardship, the Society now considers itself a guardian of earth’s endangered inhabitants and dwindling resources. As one of the world’s largest scientific non-profit educational institutions, the National Geographic Society is now searching for ways to reach out and educate people on the importance of keeping themselves, their fellow travelers and the planet happy and healthy.